Fake Geek Girl is a fun short story that brings magic to an Australian university. The world-building was one of my favourite parts of the story. It’s set in an alternate version of the present where magic (also referred to as the Real) and technology (the Unreal) exist uneasily alongside each other. Magic is very much the norm, with almost everyone having some degree of magic proficiency. Students have laptops and mobile phones they need to keep protected from magic radiation, and heaven help the student who tries to use magic Post-Its on his ordinary textbook. The university likewise reflects this dichotomy, with the more prestigious College of the Real teaching thaumaturgy and similar magic classes, while the College of the Unreal includes Gender Studies and Unreal Literature. The characters were also wonderful. Each character is distinct, with their own personalities and quirks. Hebe is a sweet girl who cares about her friends and isn’t afraid to snark when she’s constantly mistaken for her rock-star twin sister. Sage is the glue that holds the band together… well, usually. And shy Juniper’s love affair with Jane Austen was gorgeous. I was actually a little disappointed we didn’t get to see more of her, but I’m hoping that may be rectified in a later story. As you might gather, friendship is very much at the heart of the story. Changing circumstances threaten to steal away one friend, but has simultaneously delivered a new one. The characters don’t always face these changes with grace, making them very relatable. They also come with a side order of banter. The story is written in first person with the author’s distinctive voice–sarcastic but fun and upbeat. The chapters alternate perspectives, with the heading title incorporating the perspective character’s name. Despite this, I didn’t immediately twig to the shift in perspective and it threw me off in the second chapter. However, the story was too much fun not to persist. 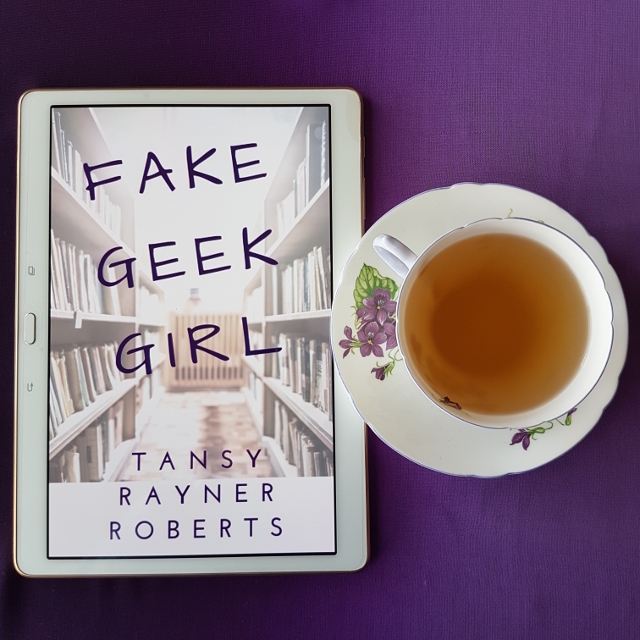 Overall, I really enjoyed Fake Geek Girl and the series has become my new favourite of the author’s work.